Buy & Sell 5 Gram Gold PAMPsAt BlueVault you get the best local prices on Gold PAMPs. Spot Gold 7:45 AM Pacific 4/25/2019. Up/down since last London close. 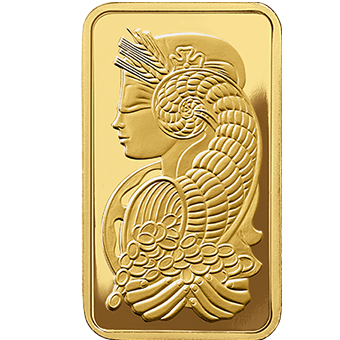 The 5g Gold PAMP Bar, is minted by the PAMP (Produits Artistiques Métaux Précieux, or Precious Artistic Metal Products) refinery based in Ticino, Switzerland. Since 1977 they’ve been one the most respected precious metals mints in the world and were the first to decorate their smaller bars. Their ingot motifs have become world famous. The PAMP Bar’s obverse side features the veiled Lady Fortuna, the Roman goddess of fortune, holding a cornucopia filled with treasure. The back of the bar has the PAMP logo stamped along with its individual serial number, weight, and purity. Each bar comes sealed in its own tamper-evident assay card. The serial number on the bar matches the number on its card. The PAMP mint considers all their products to be artistic in nature. They are also a huge worldwide supplier of gold for fine jewelry. With its beauty and worldwide recognition, the 5gram Gold PAMP is a great product to consider when buying gold. At BlueVault, you can purchase 5 Gram Gold PAMPs in-person, over the counter, for the best local prices. (No online sales.) Cash, checks, bank wires are accepted. There’s no minimum or maximum purchase required. Quantity discounts are available. We buy back any gold that we sell. And we welcome first time buyers. Spot Gold 7:45 AM Pacific 4/25/2019. Up/down since last London close. 7:45 AM Pacific 4/25/2019. Up/down since last London close. I’ve been with BlueVault for 3 months. Great service and very tight security.